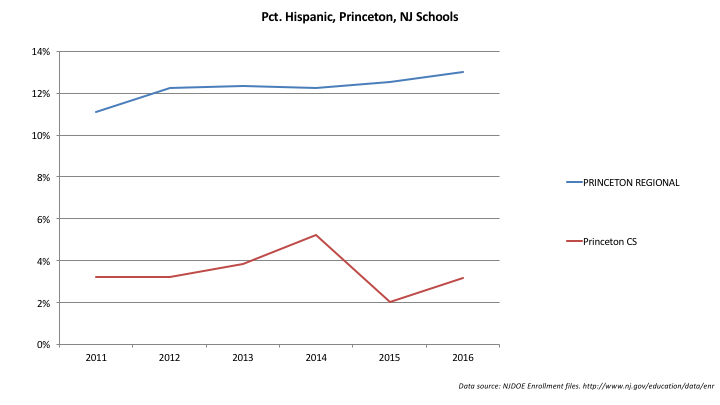 As in Franklin, NJ, it appears that charter schools are splitting the community of Princeton apart. 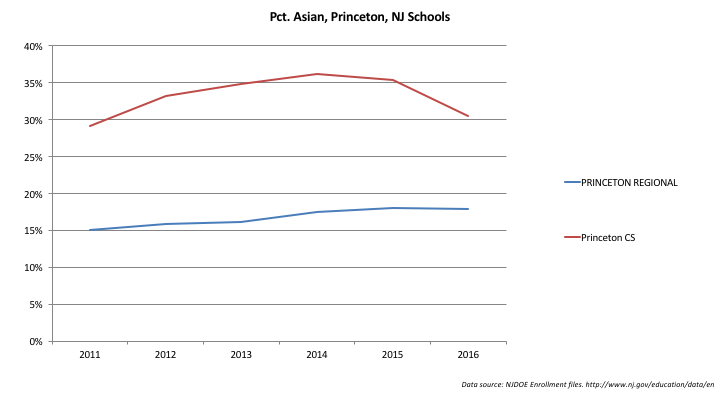 Go to planetprinceton.com, the town's hyperlocal, and you'll find lengthy and heated back-and-forths in the comments section about Princeton Charter School and the consequences of its expansion on the Princeton Public Schools. 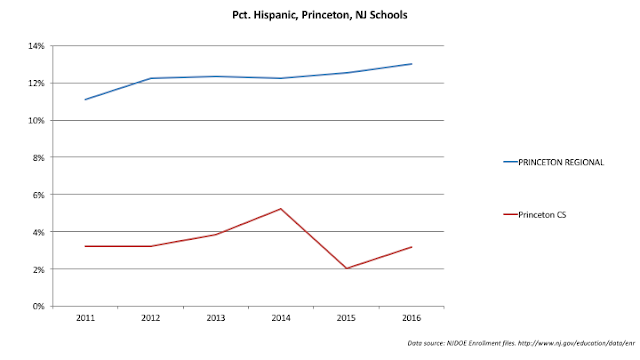 This was brought about by the NJDOE's rush to expand charter school enrollment before Chris Christie's term ends. PCS will grow from 348 to 424 students in grades K-8; as I explained before, this will undoubtedly put additional fiscal strain on the public district schools. And, as always, the local school board and the local voters have no say in whether the expansion should take place. Before I get to the data, a few things: first, while a particular charter school may work well for a particular student, personal stories are a poor way to make public policy. I have no doubt many PCS parents are happy with their children's school: good for them. 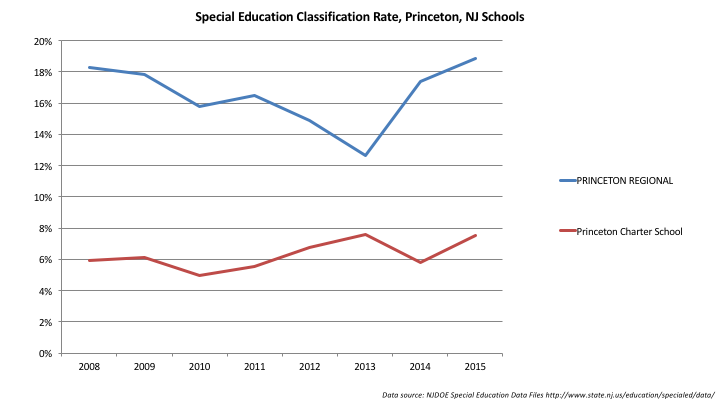 But, as I have explained previously in this series, their ability to enroll their children in a charter school comes at a cost to the other families in Princeton and the town's taxpayers. The real question in school "choice" policy is whether the alleged gains for charter school families outweigh the costs to all of the stakeholders. Those costs, by the way, include having parents within a town battling each other over charter school expansion. Second: you can go to GuideStar.org and look up the tax records of Princeton Charter School and its affiliated 501c3 organizations, of which there are at least two: PCS Endowment & Capital Fund, and Friends of PCS. In 2015, these two nonprofits held over $1.2 million in assets, and granted over $300K to the school. I assume most of this was raised by parents. There is nothing wrong, of course, with raising outside funds for your child's school: public district schools do so all the time. But any charter school that relies on such large amounts of philanthropic giving -- by my calculation, over $900 per student in 2015 -- ought not to make a claim that they are "doing more with less." Which brings me to my third point: while the data clearly shows that PCS enrolls students with special needs, the proportion of their student populations with those needs is considerably lower than PCS's. Again, it's great that individual parents may have had positive experiences with a particular charter school -- but that doesn't make overall trends showing segregation by special need any less true. 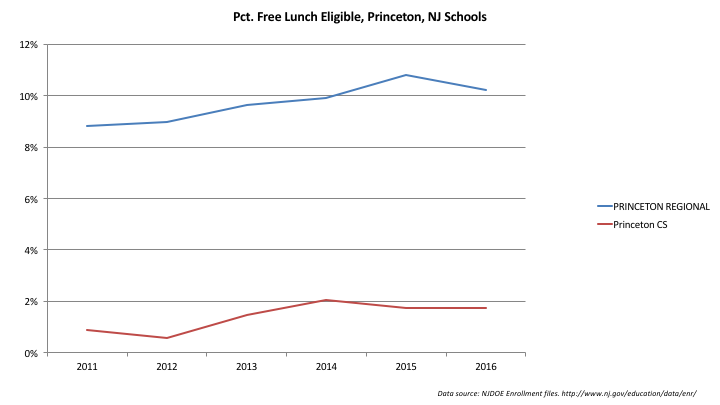 Like most suburban New Jersey charter schools, PCS enrolls fewer students eligible for free lunch, a proxy measure of economic disadvantage. This is true year after year. 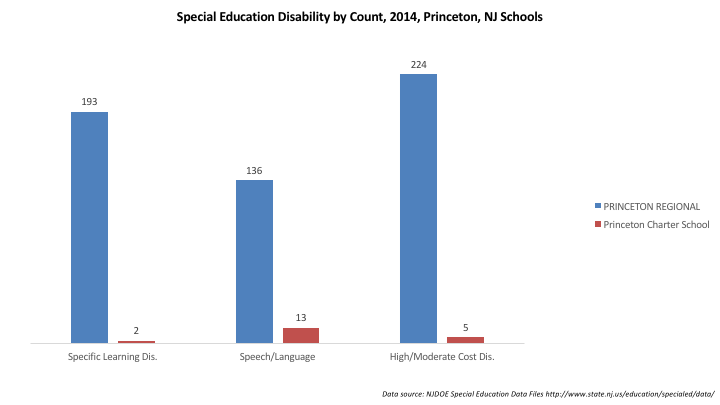 The state's 2011 cost report clearly delineates between these disabilities -- but charter school reimbursements only divide students into speech/not-speech categories. This is a serious problem that needs to be addressed; until then, the concentration of higher-cost special education students into public district schools and away from charters remains creates profound fiscal stress for districts like Princeton. PCS actually has a relatively experienced staff compared to most New Jersey charters; still, they have fewer highly-experienced staff compared to PPS. As Martin Carnoy recently noted,* this potentially creates a "free rider" problem for public school districts: charter staffs know they can potentially transfer to higher-paying jobs in district schools after a few years, so they are willing to put up with lower pay earlier in their careers. 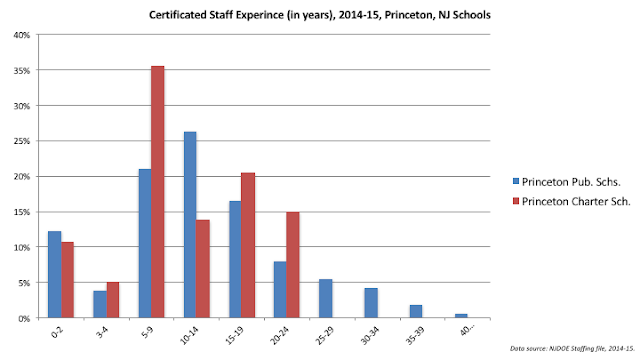 The data is noisy because the number of PCS certificated staff who aren't administrators is small. 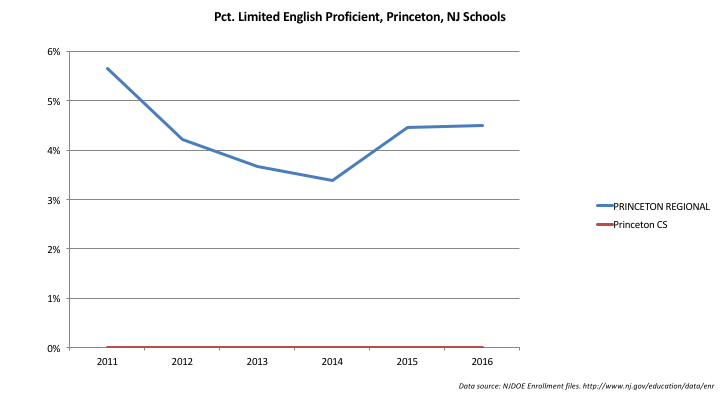 Still, with the exception of the initial bump (which appears to be caused by one exceptionally well-paid novice teacher -- is this data error? 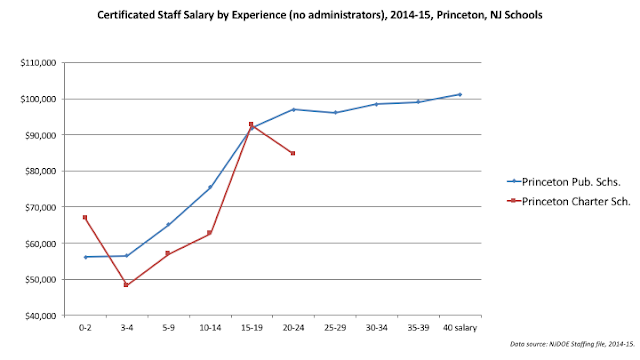 ), PCS teachers are generally paid less than PPS teachers with similar experience. 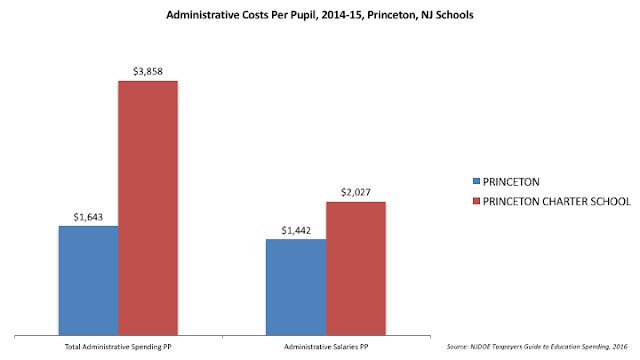 But there is one area where PCS spends considerably more than PPS: administration. The charter spends much more than the public school district on administration, and that includes spending on salaries for administrators. Again, charters generally can't leverage economies of scale like public school districts can. Which means the luxury of "choice" is costing taxpayers money they would save if charter schools were more efficient. I use "budgetary costs per pupil" as the measure here because, as I've explained repeatedly, you can't compare budgets that includes, say, transportation if the charters rely on the districts to provide that transportation. Anyone who compares overall budgets of charters and public district schools without taking this simple fact into account has no idea what they are talking about and should be ignored. 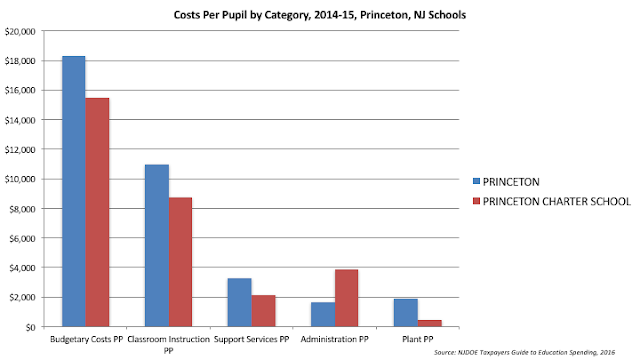 Yes, PCS spends less per pupil. Part of that is that they spend less "in the classroom" -- on salaries for more experienced teachers (again, there's that "free rider" problem). But they also spend less on support services: things like librarians and child study teams and school nurses who provide valuable services, especially for children with special needs. 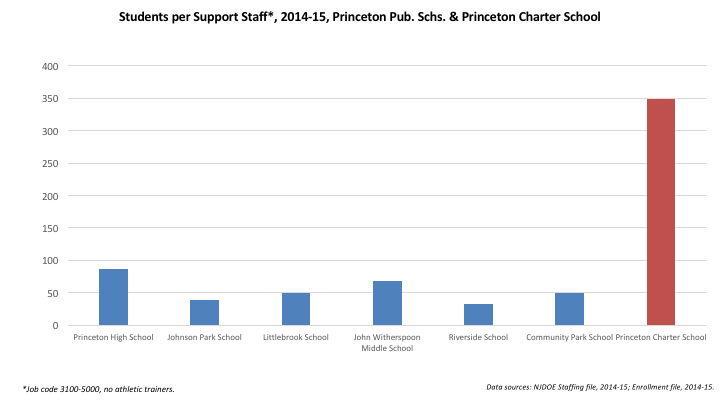 According to the staffing file I have, PCS had one school counselor for 348 students -- that's all of their support staff. I can only go with the data I've got, folks, and this shows PCS doesn't have occupational therapists or social workers or any other number of certificated support staff. Maybe PCS, given its student population, feels they don't need them. That's fine... but it also illustrates that different student populations create different staffing needs and, therefore, different fiscal pressures. Which is why the claim of PCS supporters that their school isn't stressing the host district is very weak. In Grades 3 through 5, PCS pretty much looks like any other school in the town. "Value" fluctuates grade-by-grade, likely due to cohort effects. PCS is behind Witherspoon in Grade 6, and then ahead in Grades 7 & 8 -- but only by a few points. Keep in mind: the PARCC scores go from 650 to 850, so 5 points or so is really not a very big deal. 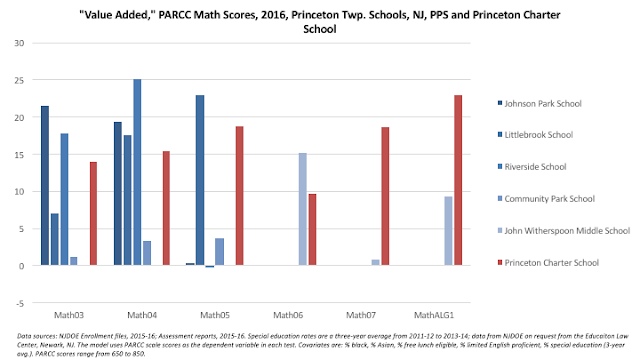 Again, from Grades 3 to 5, PCS does OK, but is hardly over and above every PPS school. Witherspoon has the advantage in Grade 6; that turns around in Grade 7 and for algebra. But why? If PCS had some clear instructional advantage, wouldn't we see that in many grades? And a 13 point gain in algebra is nice, but is it really earth-shaking? Might it be explained not by differences in schooling, but by unobserved differences in students? One point worth making about these graphs is that both PPS and PCS regularly beat predicted scores; not always, but quite a bit. Looking through some of the comments at Planet Princeton, at least some of the PCS advocates agree that PPS is a good school system. They contend, however, that PCS is better for their child. Again, that's fine -- but as a matter of policy, we have to weigh the preferences of these parents against the costs of "choice." So what do we find? A "free rider" problem with staff salaries. 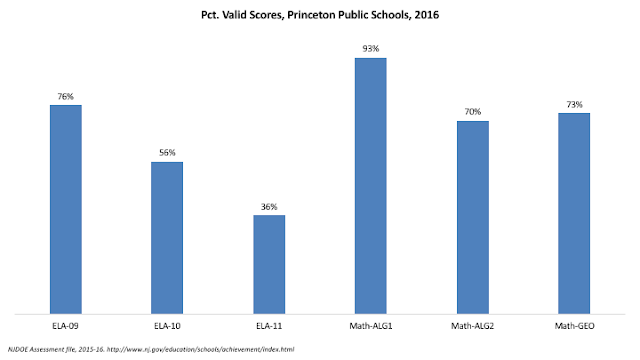 Now, maybe PCS advocates think the test scores aren't the true "gain" -- that there is a value in being able to have a "choice" in your child's school. OK... but why, then, must PCS expand? Can't it survive at its current enrollment level? Must it continue to grow, no matter how that harms PPS, or how much running a redundant school system costs taxpayers? Shouldn't one of the "choices" for Princeton's parents be a public school system that isn't fiscally stressed by an expanding charter school? It would be great if we had unlimited resources to pour into schools, and we could spend money to give every parent exactly what he or she wants for their child. But we can't even fund the state's own law when it comes to school funding. 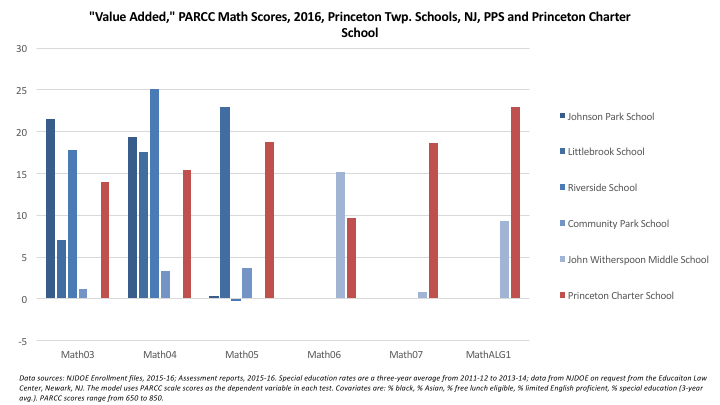 How can we, therefore, possibly justify spending extra money to satisfy the desire of a small group of families in an affluent township -- which already has a very good school district -- to send their children to a redundant and separate school system? 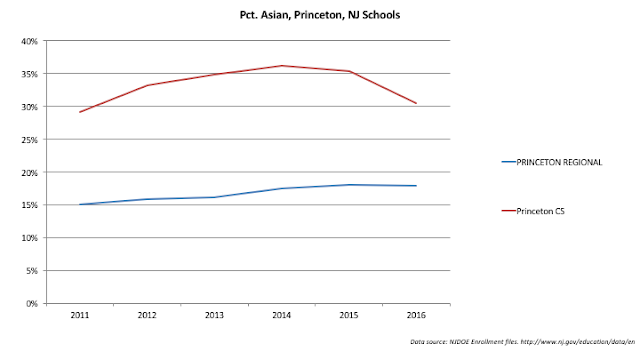 In addition: the Princeton area is well-known for having many fine private schools. Bifulco and Repack (2014) note that "...charter schools can be expected to attract some number of students from private schools." How many PCS students would be enrolled in a private school if the charter did not exist? What extra burden have the citizens of Princeton taken on by having to host a charter school? 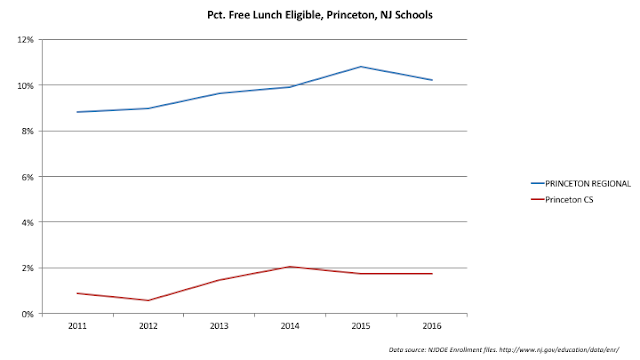 How much will that burden expand when PCS's enrollment grows? These are important questions, and they can't simply be brushed aside because some parents demand "choices" for their children. Public schools are meant to serve the public -- all of the public. And it's very difficult to see how all of Princeton's citizens are served by allowing this expansion to go forward. * Carnoy makes his point in the case of private voucher schools, but the argument is germane to charters as well. 1) How interesting it is you focus on Princeton when your Ph.D advisor is Julia Sass Rubin, who is neck deep in Princeton charter school politics right now. Did she direct you to write this blog? 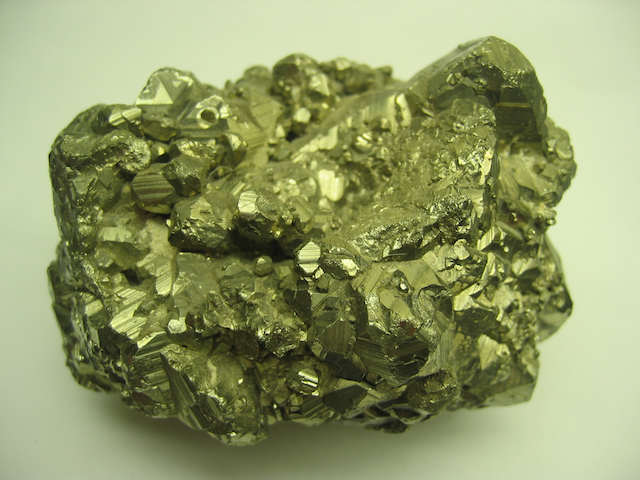 2) Do you always try to influence educational policy by referencing local blog comments but not their substance? I've got no Ph.D, but that doesn't seem like the definition of "scholarly" to me. 3) If you ever have an autistic child treated as a discipline problem that the school district didn't catch, I sure hope you have five figures cash and alternate schools to throw at the problem like we did. As it is, maybe you should back up and interview some people who've tried public school fare and decided against it. I'm easy to find - happy to do an interview anytime. Thank you for commenting, Liz. As I explained on Twitter, Julia is not my advisor; that's Bruce Baker. Julia is at Bloustein School of Public Policy; I'm at the Grad Schl of Ed. I have presented at conferences organized by Julia, and we have written things together. A cursory look through my blog will show I write extensively about charter schools and other forms of "choice," with in and out of NJ. Princeton is just another case for me, like Boston or Grand Rapids, MI or Florida or any of dozens of areas I've written about. Thanks Mark for clarifying that. Bruce Baker, you may know, ran data through a sausage grinder showing PCS #622 in the state. At what point might common sense kick in that this isn't true? You do write extensively about charter schools... as to be expected under Baker and Rubin. I repeat the offer - as a Ph.D student (I was with my husband when he was in grad school), you need to get out there and do your own field work. Whether you come out pro, anti, or neutral, scholarship isn't much if it's derivative from other sources. I'll be source #1, and happy to introduce you to others. Unless, of course, you're not actually in the business of scholarship, and more in the business of axes to grind. But I give you the benefit of the doubt. 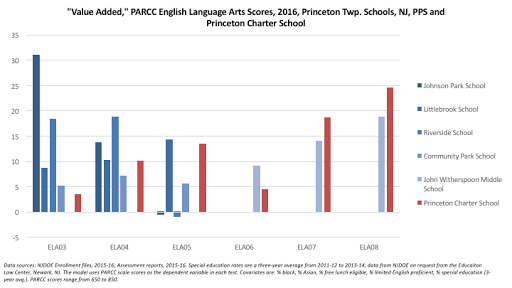 As a matter of accuracy, btw - my son receives OT and PT at Princeton Charter Schools. It's an outside contract. 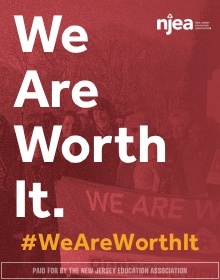 Because there is not an occupational therapist on the PCS payroll doesn't mean one isn't available. I've said this before when iffy anti-PCS data has been presented (e.g. that there were no autistic students, when I knew there was at least one because again, my son) - why don't you just call PCS and *ask* if you're concerned about data noise or can't find a data point you're looking for? They're not mean ogres, I promise. Also, on the "free rider" problem - how many teachers have ever left PCS to go to PPS? Again, it might be interesting to ask the school this, as well as what their teacher retention rate is.